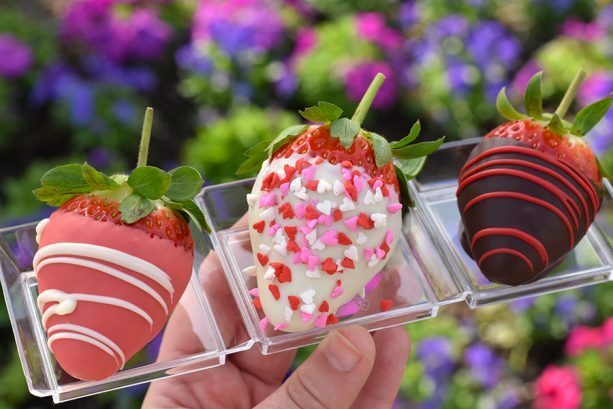 Epcot’s Starbucks stop, Fountain View, is where you’ll find a Valentine’s Day Chocolate Cupcake with strawberry white chocolate mousse, strawberry buttercream, chocolate ganache drips, “disco dust,” a chocolate heart ganache and strawberry crispy pearls now through February 17. 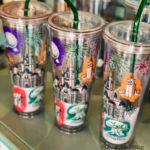 If you’ve got a Disney World trip coming up soon, be sure to check out our Valentine’s Day Sale over at DFBStore.com!! 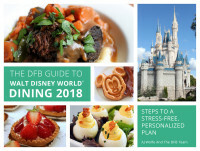 Pick up any of our critically acclaimed DFB Guide e-books or bundles and take 40% off with code ❤️ DFBLOVE ❤️ for a limited time! And only on February 14th, Sunshine Seasons will serve heart-shaped Red Velvet Cake with strawberry mousse filling, chocolate pearls and edible flowers. Animal Kingdom’s Starbucks location, Creature Comforts, will also have a Valentine’s Day Cupcake: chocolate cake with strawberry buttercream topped with chocolate and strawberry crispy pearls, mini heart sprinkles and a chocolate-covered strawberry. 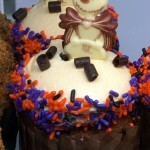 Find a Chocolate Strawberry Cupcake at both Port Orleans Resort food courts: Sassagoula Floatworks and Food Factory at French Quarter, and Riverside Mill Food Court at Riverside. 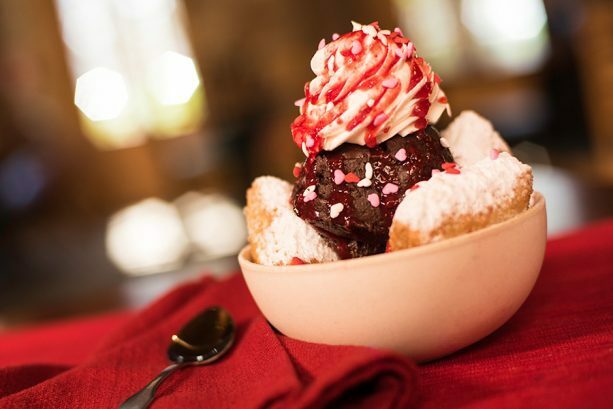 Sassagoula will have a Strawberry Beignet Sundae with chocolate ice cream, whipped cream, strawberry drizzle and heart-shaped sprinkles to boot! 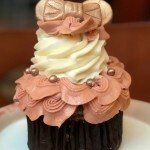 A Chocolate Cupcake with Chambord cream filling and topped with raspberry ganache icing, raspberry chocolate hearts and crispy pearls can be your at Roaring Fork in Wilderness Lodge. Stop by the BoardWalk Bakery on your BoardWalk stroll to grab a Valentine’s Day Red Velvet Cupcake with chocolate-cherry filling and a ganache-dipped chocolate red rose. 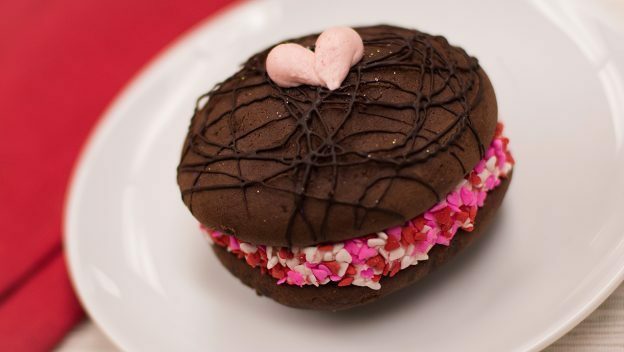 Intermission Food Court at All Star Music will feature a Chocolate Strawberry Whoopie Pie, a Red Fruit Cupcake and a Raspberry Ganache Cheesecake. 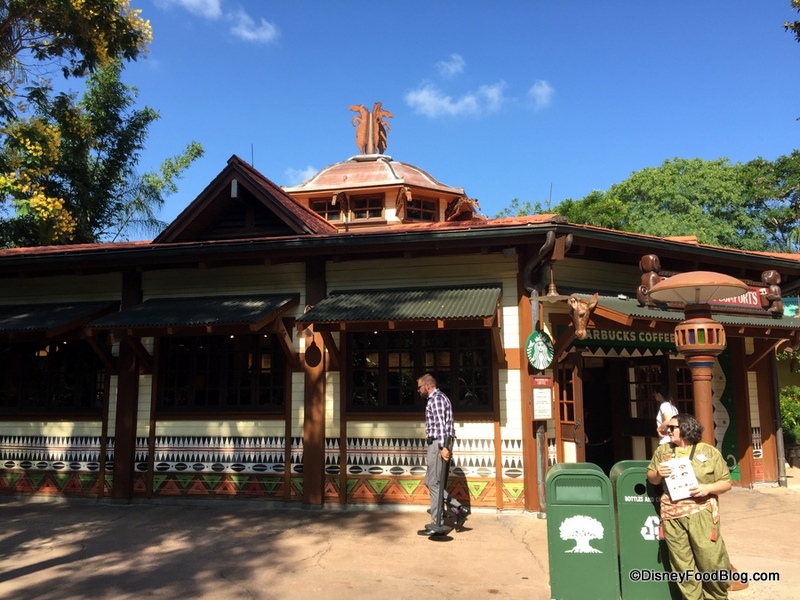 Both Saratoga Springs Resort (The Artist’s Palette) and Old Key West Resort (Good’s Food to Go) will serve a Chocolate Raspberry Cupcake. 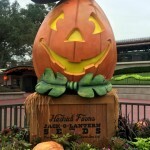 And Saratoga Springs specifically will sell gift boxes with chocolate-covered strawberries. 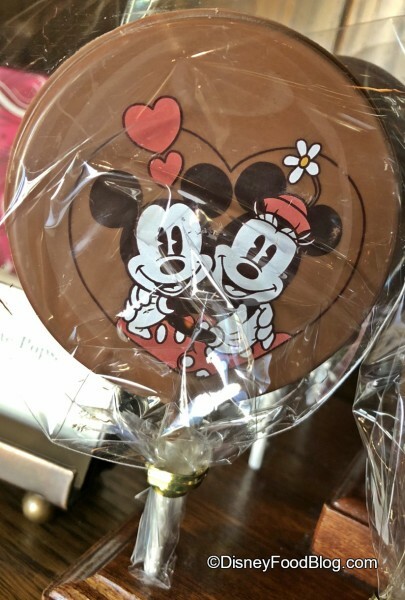 Disney Springs is home to more than one terrific sweet stop, and among the Valentine’s Day options are special Petit Cakes and more at Amorette’s Patisserie. 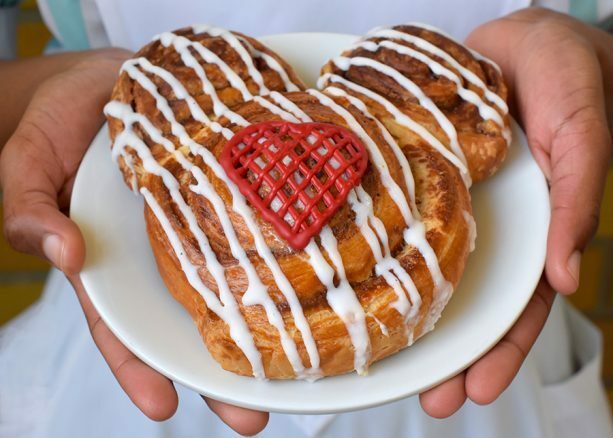 From February 11 – 17, you can order a Beauty and the Beast-themed Rose Petit Honey Cake with Grand Marnier-soaked strawberries, rum roasted pineapple and honey Chantilly cream. 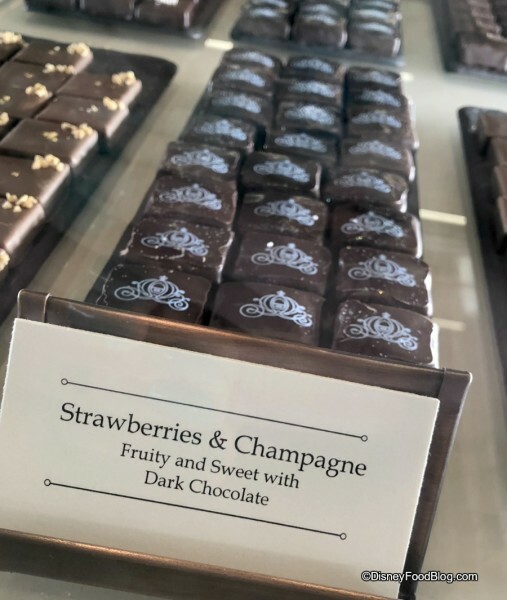 Or try a Strawberry Champagne Toast Dessert, made of strawberry mousse with a Champagne gelée Feuilletine crunch and strawberry pâté de fruit. At The Ganachery, the Strawberries and Champagne Ganache is decorated with Cinderella’s Coach. And beyond that featured flavor there are Valentine Chocolate Lollipops and Raspberry and Dark Chocolate Marshmallows. 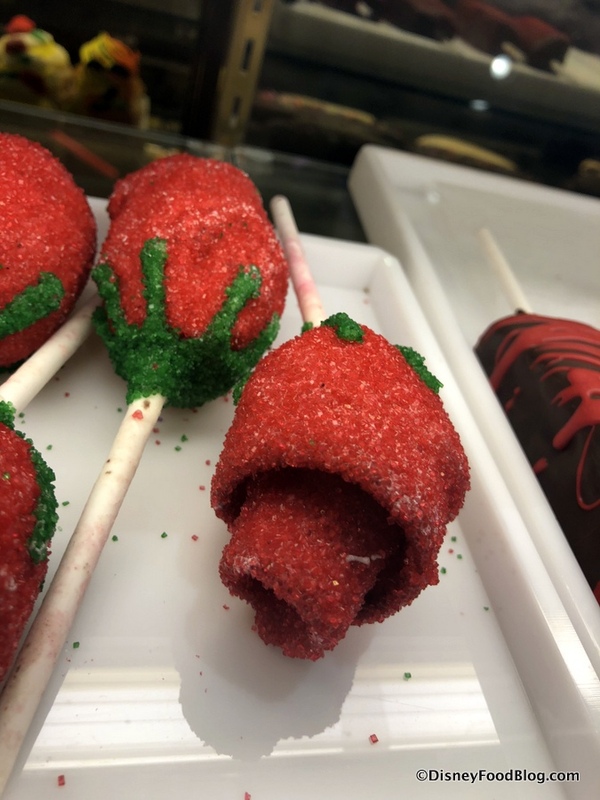 Look all over Disneyland Resort to find Cherry Vanilla Cotton Candy, Pink Minnie Apples, Pink Chocolate Krispy Treats, and Red Rose Cake Pops. February’s Gourmet Apple of the Month is the Black Forest Cherry Caramel Apple with cherries, nuts and chocolate drizzle. 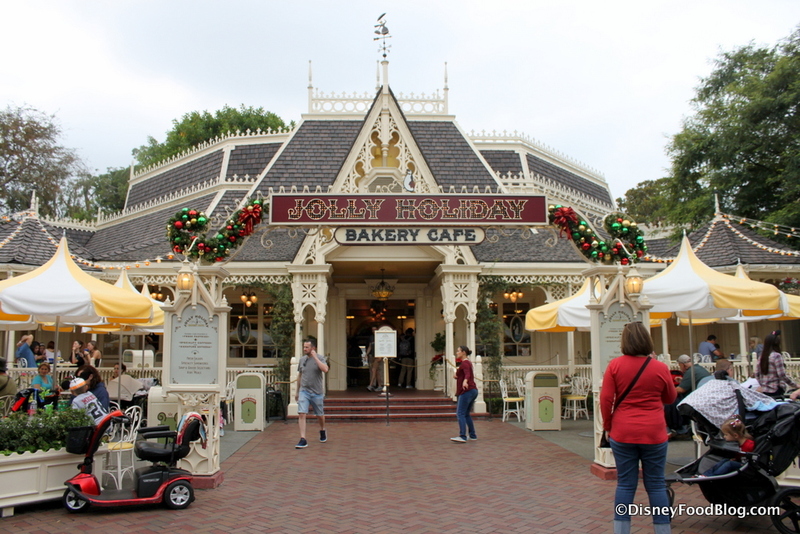 In Disneyland, Jolly Holiday Bakery Cafe will serve heart-shaped Strawberry Macarons. 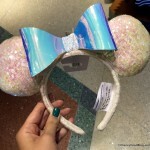 If you’re dining at Blue Bayou Restaurant, you may order a Sweetheart Toast Sparkling Cider. Clarabelle’s Hand Scooped Ice Cream in Disney California Adventure will feature a special Valentine Sundae. 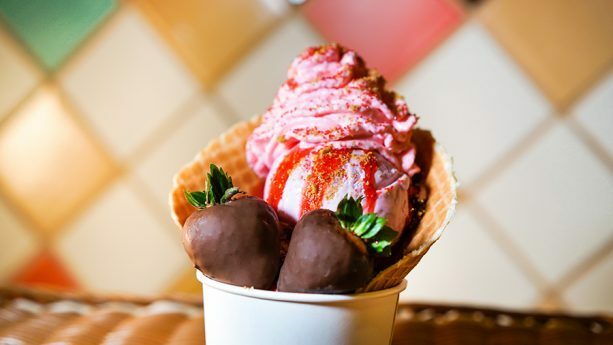 This treat is made of scoops of vanilla and strawberry ice cream and is topped with strawberry topping, a chocolate-dipped strawberry and pink peppermint whipped cream and comes served in a hand-made waffle cup. Finally, find a Chocolate Strawberry Smoothie at Schmoozies. No matter where you find yourself on February 14th, we wish you a Happy Valentine’s Day! « Happy Valentine’s WEEK! Save 40% off Everything at the DFB Store!